Throughout April we are celebrating DIY Month and today we’ve got a super trendy, yet practical make for you. Punctuate your living space with our colourful DIY Succulent Notice board! This is a clever way to display your notes and photographs whilst adding a sprinkling of floral fun to your home décor! For this make, we’ve created a variety of felt flora and fauna that you can clip onto the board in order to showcase your memories, important to-do lists, and more! Succulents are still a huge trend and what’s great about these beautiful felt versions is that they don’t need to be watered! You can experiment with different shades of felt to create a variety of plants and flowers and accessorise your board. 1. Cut two identical pennant shapes from the thick card. 2. Cut the centre from one of the pennant shapes, leaving a substantial border around the aperture. 3. Use the pennant shape as a template and cut out a sheet of the beautiful Let’s Celebrate paper to cover the front of your board. You will need to cut out the aperture from the paper too. 4. Carefully cut the wire to fit behind the aperture you created in the card, allowing 2cms extra to allow you to tape it securely to the back. Use a strong DIY tape to adhere the wire to the card, ensuring that you cover any sharp edges. 5. Adhere the Let’s Celebrate paper to the front of your pennant shape. 6. Now cover your second pennant shape with a paper from the Let’s Celebrate paper pad. We used a complementing design from that which will cover the front of our board. 7. Cut small strips of the thick cardboard and attach them to the edges of your second pennant shape. This means that when the two pennants are adhered together, there’s a space between that will allow for the pegs to be clipped to the wire. 8. Punch two holes at the top of both banners in order to thread ribbon through to hang your banner. 9. Adhere both pennant shapes together. 10. 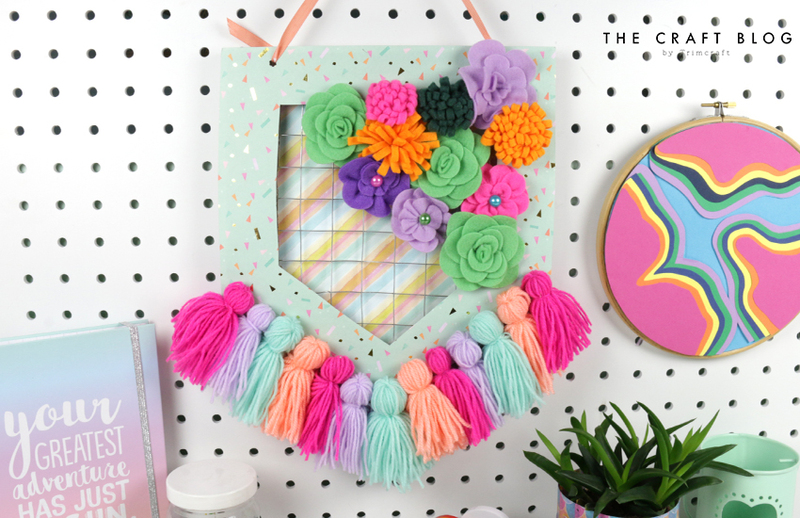 Using wool, create a number of tassels to decorate the bottom of your notice board and adhere them with hot glue. Trim the tassels to neaten them up if needed. 11. Make a selection of different flowers and succulents from the Dovecraft felt. 12. Add a peg to the back of the flowers with a hot glue gun so that you can attach them to your board. Adhere some of the flowers to the edge of the frame for added decoration, if you like. 13. Clip your pegs to the notice board. You can now add your notes and photographs! String a length of ribbon through the holes that you punched earlier, secure, and hang in your chosen spot. Will you be creating your own succulent board? We’d love to see if you create your own! Don’t forget to #Trimcraft when uploading to social media and to share your projects in the Inspiration area. Such a HAPPY project here, that can really bring out a smile on anyones face, I´m sure. Great idea and thanks for the tut here too.